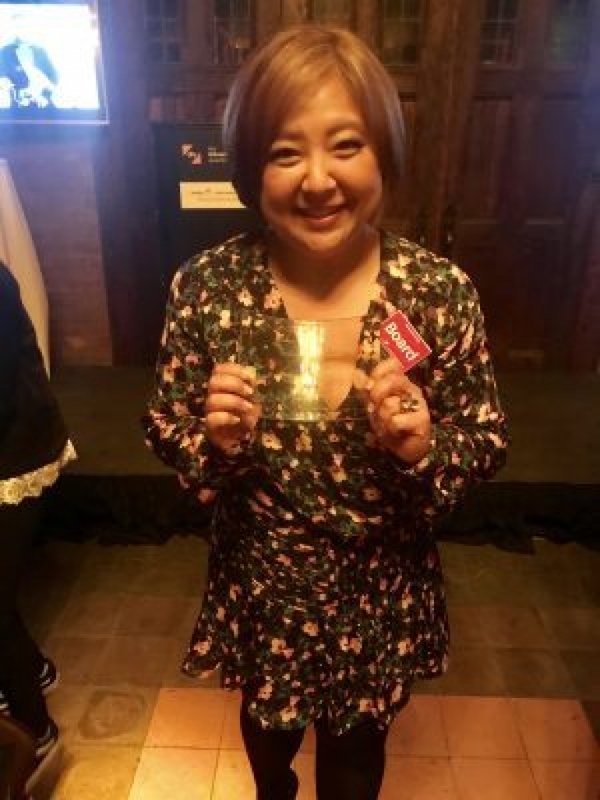 It was my privilege to attend the Diversity in Tech Awards for the second year, at the Bowery Hotel in NYC on May 22! The mission of the evening was to bring people in the tech industry together to invest their “time, talent and treasures,” in an effort to decrease the diversity gap in STEM by empowering students to create with technology. It was a night to honor teachers and students who are making names for themselves within the industry, while promoting the initiative to provide more opportunities for STEM programs in schools. All proceeds went to the nonprofit Mouse (a national youth development organization that empowers young people to create technology with purpose) and Code Interactive (a nonprofit that trains educators and builds inclusive computer science programs). The evening started with a panel, “Building a Diverse Tech Talent Pipeline,” which had an impressive list of panelists. They discussed keeping STEM programs active in schools, and the need for more diverse talent in the workforce. The panel consisted of: Mark Anthony Thomas, Senior Vice President of Partnerships at New York City Economic Development Corporation; Ryan Dennin, Senior Director of Retail at Best Buy; Kelli Dragovich, Senior Vice President of People Operations/HR at Hired, Inc.; Omari Edwards, Founder of Beak; Rick Gomez, Vice President of Human Resources and Advertising & Analytics at AT&T; and Lisa Opoku, Chief Operating Officer at Goldman Sachs Technology Division. Before the honorees received their awards for the evening — and there were several — there was a brief break where everyone enjoyed hors d’oeuvres and mingled. 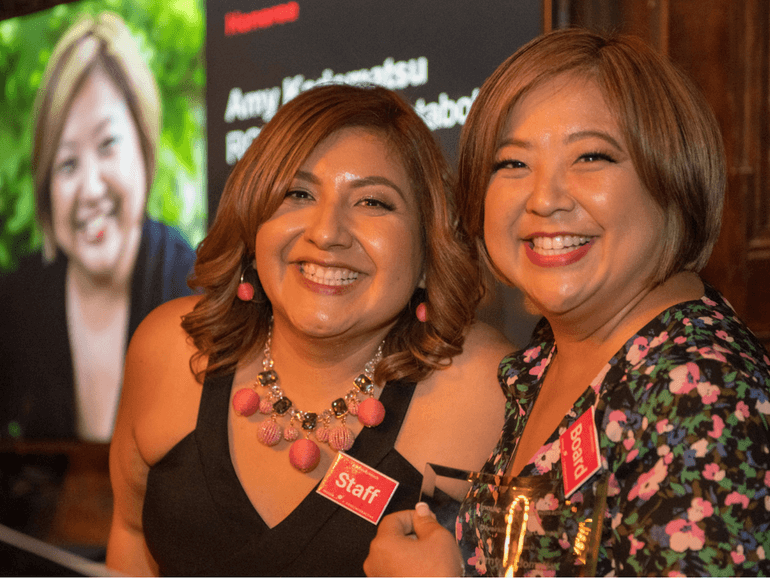 One of the board honorees was Amy Kadomatsu, Co-Founder and President of Instabot (an enterprise chatbot platform) and co-founder of ROKO Labs (a product strategy and technology consultancy). To Amy, the word “Bold” means to, “think outside of the box, breaking the boundaries, and sometimes breaking the rules.” She mentioned that, “As a short Asian woman, being bold surprises and amazes people, which allows me to show people what I can do.” People assume things just by looking at her. They don’t realize that she is a bold woman who has decided to implement change in the tech industry. Kirk McDonald, who co-hosted the awards last year, was also an honoree. He is the Chief Marketing Officer at the AT&T Advertising and Analytics company. He is also the Board Director of the I.D.E.A. Initiative, an organization dedicated to being the voice and the destination for addressing inclusion, diversity, equality, and awareness in business. It was a pleasure to see him nominated this year. 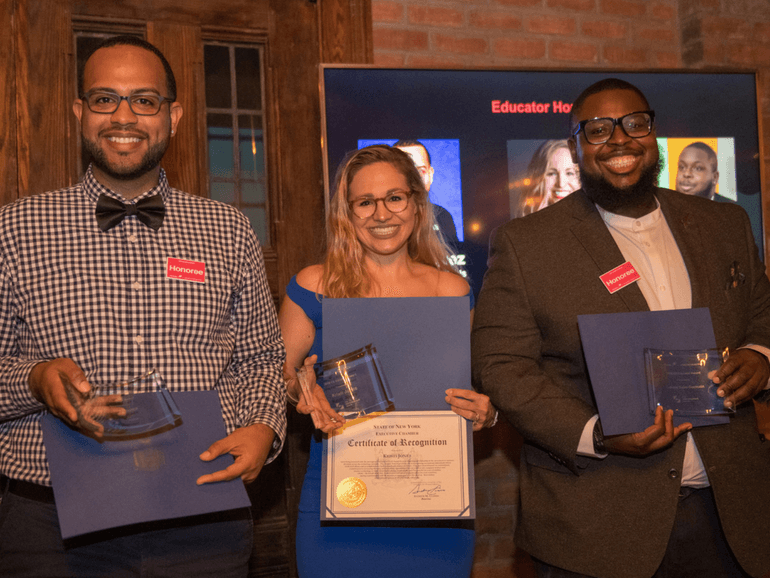 The Educator Honorees were Edwin Jaquez of KIPP Washington Heights Middle School, Kristi Jones of the High School of Hospitality and Management and Donald Saint-Germain of WINGS Academy High School. When asked what “Bold” means to him, Donald, who is of Haitian descent like myself, stated that it means to, “take risks, and not to be afraid to stand out among your peers.” He thinks about the word “Bold” often, and when he does it is always in regards to his students. He empowers them to think about how they, too, can stand out and be unique. One of the Youth Honorees was Kimari Rennis of DreamYard Prep who says that being bold means, “Being able to stand up for yourself, and to have the bravery to take on opportunities that are in your path.” Kimari, a 15-year-old African-American girl, considers herself to be an introvert. She has taken on the word “Bold” by making her introversion work in her favor and exposing herself to the tech community. She puts herself in a position to be exposed to new ideas and technology, and by doing so she believes, “That is what has gotten me here, in a position to be honored with a Diversity in Tech Award tonight.” Kamari said she aspires to be a video game designer. The next honoree is Khaleel Anderson of Queens College. He cares about people, and uses technology to help those who are “differently abled.” To him, “Bold” means to be, “Strong. Going out on a limb, standing out, and being highlighted while taking what’s in your grasp and elevating it to new levels.” He is truly an advocate for change. Thankfully, we are both in the position to help others, and technology has allowed him to do so to the best of his ability. Peizhu Yuan, who is the ultimate Mouse alum, was honored as well. She was in the Mouse after school program her sophomore year in high school, a Mouse intern during college, and now she is a Communication Coordinator for Mouse. To Peizhu, “Bold” means, “To be very straightforward with no camouflage, and to represent a person who is very grounded.” Because she has been grounded in the Mouse program, she has been able to excel professionally. The final youth honoree was Ivan Pereda-Zorrilla, a Software Engineer at Bloomberg. He has benefited from being a part of the Mouse program since he was in middle school. To Ivan, being “Bold” means, “Going for the unexpected and being unconventional without any fear of consequences.” He also thinks that being bold allows you to do what is asked of you without any guidance. He encourages people to be themselves while implementing change, and helping others understand the social impact. Ivan believes that being Bold is exciting! I would too if I had made the moves that he has, including taking advantage of the Mouse program to get a job at Bloomberg, one of the top business organizations. Way to go, Ivan! 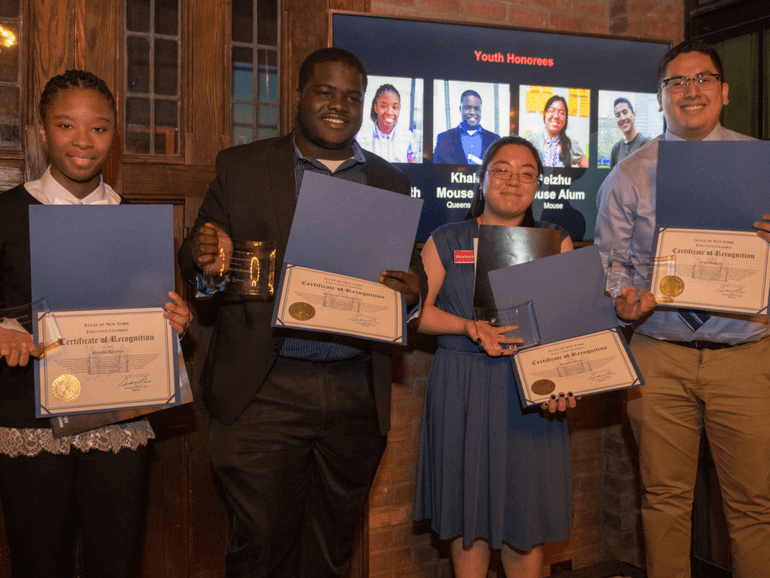 It goes without saying that the youth honorees were the highlight of the evening, and are the direct results of the success of the Mouse program. Hence the push to increase funding for their initiatives. Mouse positively impacts the youth interested in the tech industry, and each story shared was a testament to its success. I left the evening feeling educated and overall, empowered by all the Bold individuals in the room. They are all amazing advocates of change for Diversity in the Tech Industry.